I'm a big fan of the Vanilla textures and always tried to find resource packs that are close to default. However, many of the good ones are outdated and/or don't have normal and specular maps included which I really like to have since I'm using shaders almost all the time. So, one lonely weekend I decided I would make my own textures - and that I did. Basically I scaled the vanilla textures up to 64x64 pixels and added some details to them that don't destroy the vanilla style. As a matter of fact at high or medium distances you probably won't notice the difference, just the closeup shows way more detail. Check the files tab for the mod addons. If you are viewing this from curse.com you can switch to the project site to get access to the mod addons or you can use this alternative download mirror. If you have weird colored lines and areas on blocks like bricks, make sure to check your shader settings and set the parallax occlusion map size to 64. You can use this resource pack in your mod packs if you don't make any money off it and you can redistribute it on any non-English or non-German speaking websites if you give credits to me and use the curse or alternative download links. Basically any usage is fine as long as you don't claim to be the creator and you don't make money off the pack. Is there a mod like this that uses the faithful 32x textures? Hi, your normals are so crisp and detailed. I'm trying to make some compatibility textures for a mod, but I'm having some trouble with complex shapes. Did you paint the normals by hand? Is there a normal painting tool to assist with visualization? I've tried a few programs but none seem robust enough to produce such a high quality result. I'm very curious how these were created. Thank you for such a great resource pack. Hi. For most normal I used the original texture and created a heightmap from it. Often turning it into grayscale was a solid heightmap already, with a few manual adjustments done afterwards. I then used the normal map plugin in Gimp and set the scale to 2 or 3, depending on the heightmap. Omg, this is perfect. And most of all, it's up to date! :O Thank you. This is the one I was looking for. I can't get to the add on page, it's saying to much traffic and is blocking me. Is there another mirror? Click a file in the "Files" tab and you can find the addons in the "additional files" section. Does this only occur with this pack, or with other texture packs / without any texture pack as well? Did you assign enough memory to minecraft in order for it to handle 64x texture packs? Some shaders also need to be configured to allow texture packs to work. Since this pack only supplies textures and I haven't heard of anyone else having issues so far, this seems more likely to be an issue with another part of your setup. Sorry, but I haven't tried 1.13 with shaders yet. Maybe topfpflanze can help you with that (I only do the 1.12 mod support at the moment). My best guess would be, that those shaders use the other texturemap format, that is not compatible with this pack. But that's just guessing. The BSL shader still uses the more common format. If it doesn't work with BSL, it's definitely another issue. I just tested it with 1.13.2, Optifine HD U E4 and BSL and it works like a charm :) (without changing anything, not even the memory allocation). BSL offers a lot of settings by the way, that's why I prefer it. You first have to enable Resource Pack Support (it's under "Visual...") and then you can increase the Parallax Occlusion (I usually use a strength of 2.0 instead of 1.0, this way it looks much nicer). Also, you should change the Specular Format to PBR+Emissive, since we use all 3 channels in this pack (Specularity, Metallicness, Emission). Hmm, that's strange. You usually don't have that debug saying "shader:..."
It says something with FXAA. Can you try turning that off (it's the AntiAliasing). Although your 1050 should be more than capable of handling it. Did you try other texture packs to see if this is in any way related to this pack? I looks like a more general issue, but who knows. You might want to have a look at the logs as well. Maybe there is some error showing up. And yeah, you need 7.1p4 for 1.13 as far as I know. 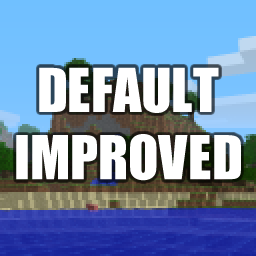 Fixed it by enabling Mipmaps :D Thank you a lot for helping me! Hi. i use BSL but the chests are black with this shader like there is no light on the chest. do you know this problem and have a solution ?